Looking like, and often confused for a larger, less attractive version of the regular snowdrop, the 'Spring Snowflake', Leucojum vernum is a popular spring flowering bulb native to southern and central Europe from Spain to Ukraine. 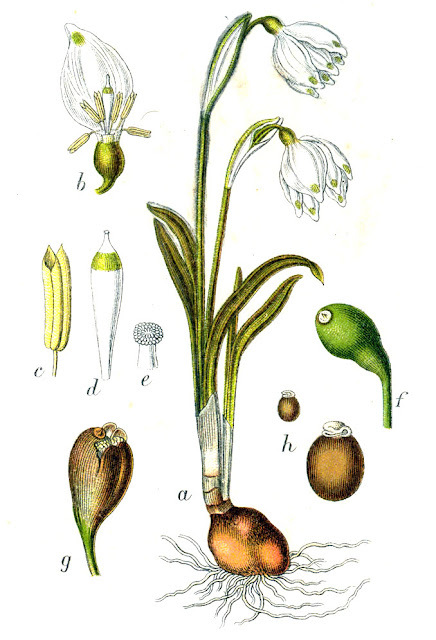 Like the snowdrop it is a member of the family Amaryllidaceae. Under favourable conditions the spring snowflake will achieve a height of approximately 15-20 cm, although it can reach up to 35 cm. It has narrow, strap-like, mid to dark green leaves. Leucojum vernum will usually come into bloom from mid-February to March, one or two weeks later than the common snowdrop species. The fragrant flowers are small and bell-shaped, white with a green (occasionally yellow) spot at the end of each tepal. The spring snowflake will perform best in moist conditions and is also tolerant of shade. The are best planted as fresh bulbs (in the green) in late summer to early autumn. Plant Leucojum vernum bulbs 8-10 cm deep. Once clumps become overcrowded, lift and divide as the leaves begin to die down in the autumn.